BOS BAG Combo - for chemical free fly control!!! Reusable dustbag for Chemical Free insect treatment for livestock applications. 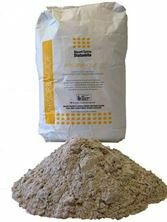 Bos Bag plus 4kg Certified Organic Absorba-Cide. Also available seperately. Designed and trialed at the Agvention centre in Kandanga the BOS BAG is a simple, chemical free and effective means of treating your cattle with non-residual fly control products. This option comes as a bundle with the certified organic insecticide - Absorbacide. 1. When you get your BOS BAG you will need to find a wood or steel horizontal support pole no shorter than about 120cm to slot through the top "folded" end of the bag. Make sure you insert through the middle of the two layers of hessian and the canvas outer. Screw or tie the bag at each end to the pole to ensure bunching doesn’t occur. Pole diameter may be up to 40 or 50mm and the pole will only have to be able to support 10kg plus the extra pressure of cattle "playing" with the suspended bag. 2. Lengths of chain, cable or rope long enough to allow horizontal hanging at the desired application height should be attached to each end of the pole. Remember to re-fill the BOS BAG you will have to be able to easily take the bag down, re-fill and replace. 3. The canvas BOS BAG has eyelets that provide an alternative attachment option however it is recommended that the eyelets be used IN ADDITION to the horizontal support pole. 4. Razorback outdoor canvas care instructions can be found at www.sevenkeys.com.au. 5. To fill the BOS BAG, open the Velcro end and pour the powder bag contents carefully into the opening. Try not to get dust into the Velcro as it will affect performance of the Velcro. Don’t overfill. 6. Hang the bag in a high traffic area of the paddock with its base height a few inches below the height of the shoulder of the smallest target animals. If you are feeding lick (such as sulphur) for an integrated approach to parasite control, you may choose to place bag over lick feeding area, near entries to water or at a high-traffic shade camp area. 7. After a week, usually most animals know what the bag is for and an effect should be seen. Move the bag with the cattle if necessary and over time the cattle will seek out the bags so placement becomes less important. Dust use by bulls is usually much higher than other classes of cattle. 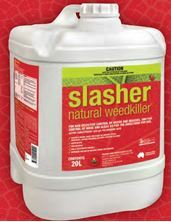 ACO certified non-selective fast acting herbicide weed killer. Regional Australia designed and manufactured. The Bos Bag gives you an economical no-fuss chemical free fly control option.